Photography is a relatively new field when it is compared with traditional forms of arts such as painting and sculpting etc. However, it has managed to develop and move forward with the help of some passionate photographers who were ready to dedicate their lives to the cause and were brave enough to test and experiment the various features and methods with which we could use photography as a very effective tool of communication. Masahisa Fukase was one of few such individuals who happened to be way ahead of his time and managed to leave such a vast abundance of work for the following generations to decipher that it is unimaginable that the history of photography, especially pertaining to post-war Japan, could ever be written without mentioning his name. The works of this photography maestro remained untouched for over two decades before they were brought to public light. The fascinating nature of his work especially those that have been documented between 1960 and 1992 have been truly inspiring and enlightening. Foam Museum in Amsterdam is one of the few places where the photographer’s work has been put on display for the public to see. Photographers come from far and wide to appreciate the work of this mastermind and build on those foundations to create a bright and dynamic future for modern photography. His seminal work, Ravens, is on display in the museum along with a lot of his work that had been done in the 60s through 1992. 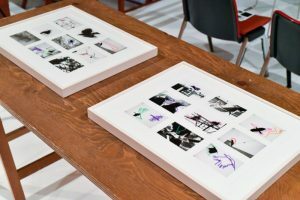 These works display, in a way, a visual biography of this photography giant who had the vision to experiment with the art in many different ways. It really gives you a feel of what was going inside his head and how he transformed his ideas in the form of his work. He was a photography genius, one who is looked upon as role model by many. He was born in the region of Hokkaido in the year 1934. Masahisa took over his grandfather’s establishment, a family photo studio, later on in life as he was the eldest among his siblings. His work was mainly inspired by Yoko, the love of his life, and whom he had married in 1964. However, after the marriage failed and they got divorced, his work took a new turn and evolved into what we now call the ‘Ravens’ series which has caught everyone’s attention. Unfortunately, the divorce left him in bad shape as he quickly adopted the habit of excessive alcohol consumption and suffered severe depression. He fell off the stairs while he was drunk and ended up in a coma which lasted for 20 years until his death which also proved to be the reason why his work remained hidden till then. The opportunity to view his work and feel the world from the lens of his camera is truly a unique chance. The work of such a photographer is rarely as well-publicized as his and it would be a terrible miss if you didn’t get to see it.